(l) Kumu Hula Kealii Reichel with Koa Hewahewa, Director of Forestry Operations at Hoku Nui. 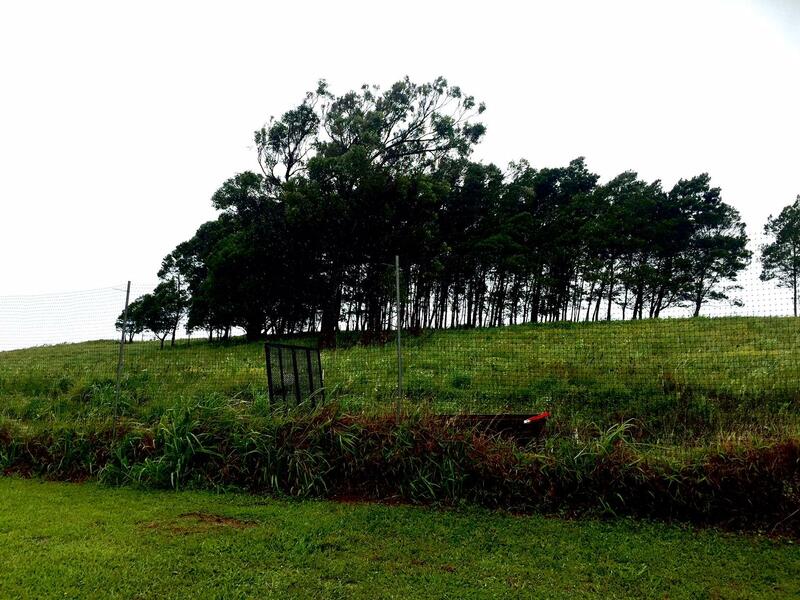 Hewahewa is the Hawaiian forestry/agriculture component, while Reichel brings the Hawaiian spiritual and cultural thread to Hoku Nui's plan for a new regenerative community in upcountry Maui. 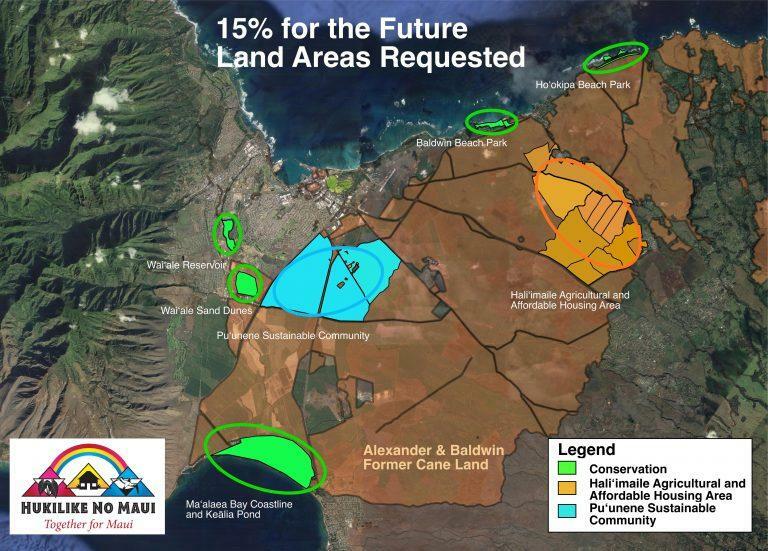 The Hoku Nui project involves 258 acres in upcountry Maui, where the idea is to have homes, farms, forestry, water harvesting, energy production, and Hawaiian cultural activities work creatively together. Relaxing in the greenhouse, conversation turned to Hawaiian protocol, its uses and nuances, find out more on that in the extended interview. Here, even a tip for hikers entering the forest. 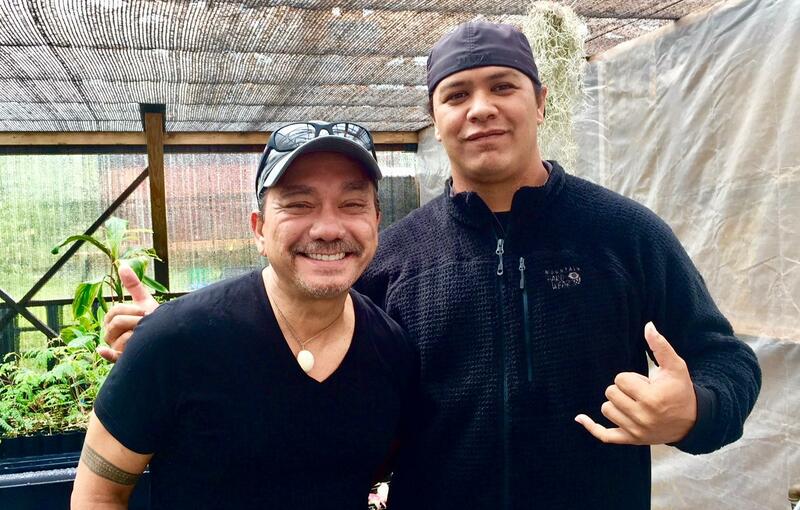 Segment of conversation with Kealii Reichel and Koa Hewahewa that dealt with protocol, its uses and nuances, its kinship with kuleana, plus Uncle Harry Mitchell's view of the practice of sunbathing. This is the first of two segments, the second, Friday, looks at Keali‘i Reichel's prototype for how Hawai’i’s hula hālau can deepen their roots and expand their cultural influence. The extended interview here deals primarily with Hawaiian protocol and its nuances. It’s a dirt and gravel road through fields of green onto the Hōkū Nui property up Pi‘iholo, upcountry a bit from Makawao town on Maui. 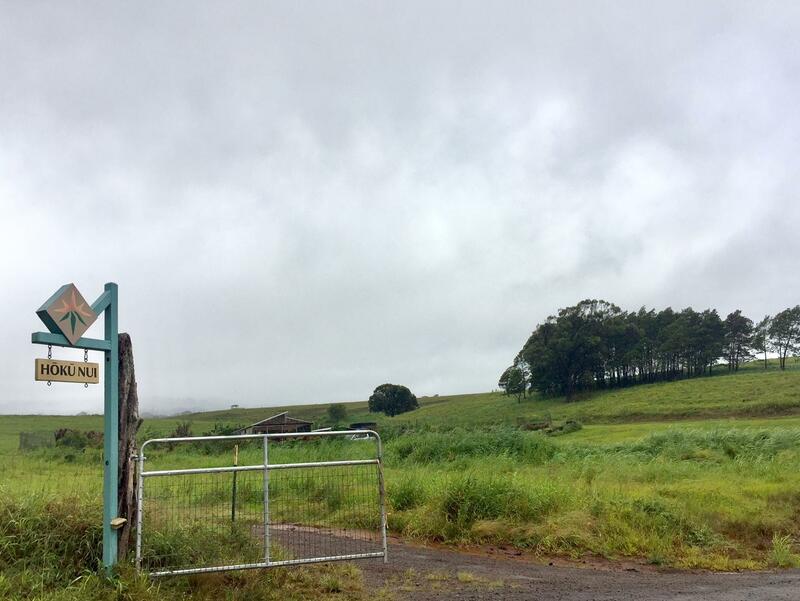 Hōkū Nui is planning homes, forestry, ag lots, and a cultural center on the 258 acre property. 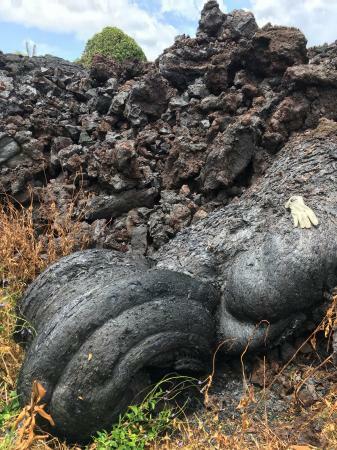 "We are in a place called Kapu‘au, right in the center of the Hōkū Nui property, which is part of the Hamakuapoko moku, part of the Makawao ahupua‘a." Kumu Hula Keali‘i Reichel surveys the green ridge where his Hālau Ke‘alaokamaile will build their new home. He is here, in part, to ensure the Hoku Nui project develops with Hawaiian values and culture. 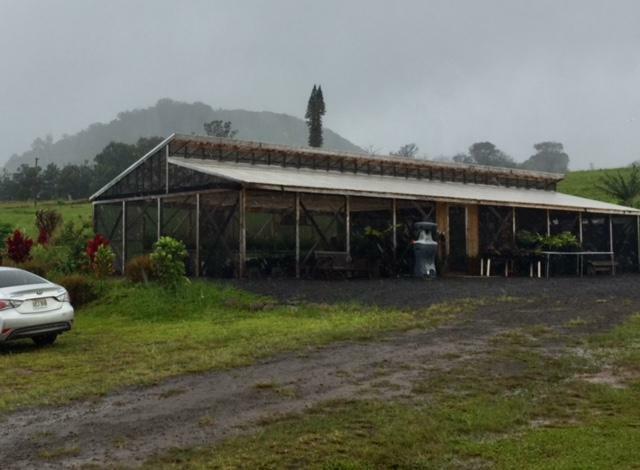 The greenhouse at Kapuau, part of the Hoku Nui, where native plant seedlings are raised for farming and reforestation. 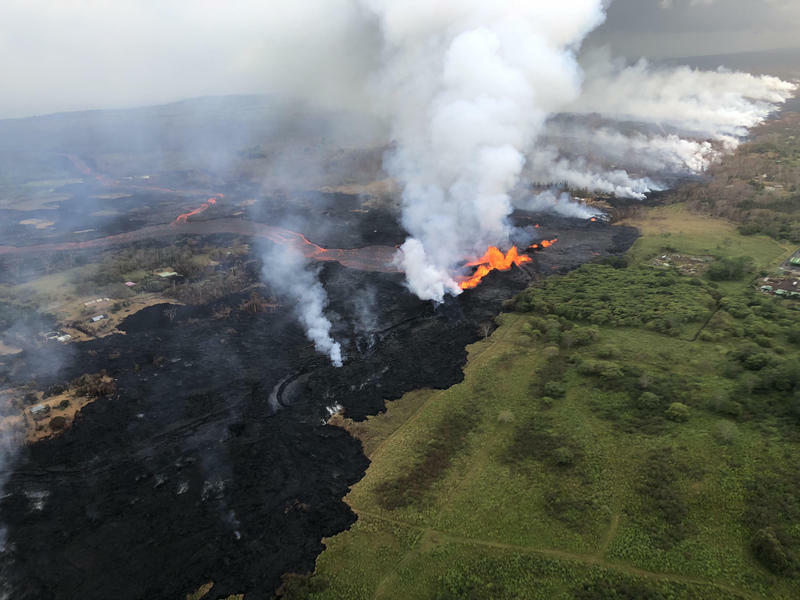 Reichel: Recognizing a sense of place, reestablishing connection with the various winds and rains that are kama‘āina to this place, and couple that with the actual topography of this land, which is hilly, which is not too cold, not too hot, not too rainy, except for today! Haha. Not too rainy, not too dry, we’re at a really good space in this particular area, in this place called Pi‘iholo, as we call it now. The rain was our companion this day, as we sat round a table in the airy greenhouse, with beds of native plant seedlings all around us. Koa Hewahewa, the Director of Forestry Operations here at Hōkū Nui, joined us. 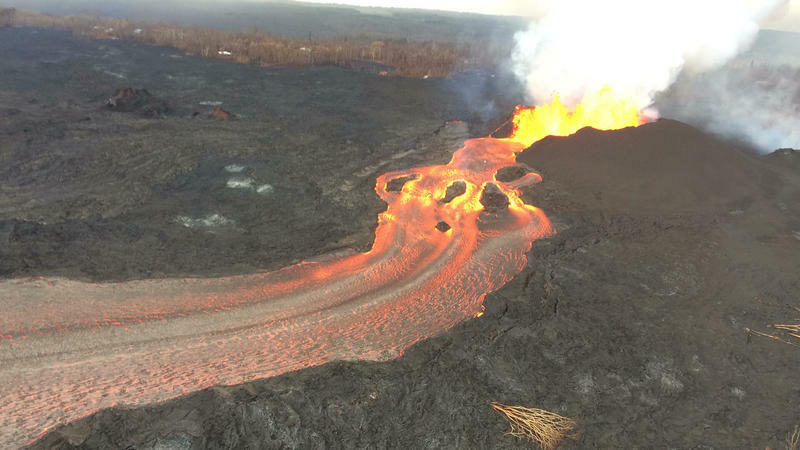 His is a Hawaiian approach to the land. Hewahewa : I like what Keali‘i told me before, normalizing protocol. That is a big component that is missing from farming, from a lot of the things we’re doing. Whether it’s construction, hospitality industry, farming--- those are run with a Western concept. Hawaiian protocol, Reichel says, is about connecting. The future home for Halau Kealaokamaile, just up the rise. Reichel: I think protocol is a large catchall term. How do we approach, and to whom do we pay homage? Protocol is also how you approach a project. Culturally does it require ceremony? Does it require permission? Does it require a chant? Does it require certain actions and thought processes before it starts? Each event that utilizes quote unquote protocol is different, and everybody’s approach is different. Beginning a project, approaching a home, would require protocols. How about for entering the forest? Is there something we should say? Reichel: Say something. Greet the forest say, eh, howzit, dis me! I’m just one little speck in this huge universe of specks. As a Hawaiian I prefer that you chant, but not everybody know how for chant, and I would much rather you not chant if you don’t know the words correctly. If you don’t know the words correctly, don’t just make any kine, because for us, words are power. You utilize what power you have in your own system. Hewahewa: I’d say, as much as you can, try and stay out of the forest. You gotta have a specific reason to go there. Our forest and our watershed is under a lot of threat. Whatever happens up ma uka always affects everything below it. Before hiking, before going into the forest, understand what it’s about. Understand the importance it holds for our ability to live here, to breathe here, to drink water here, to survive here, to continue to be here and for future generations to be here. If you going in there, make sure, mālama. Reichel: For us, we don’t go there, unless there’s a purpose. Why are you going in the forest? What is your purpose, and does your presence in the forest help the forest? Or is it detrimental? Reichel: I see the attraction. There’s a human basic necessity to reconnect to the elements. You gotta shift your thinking, because I understand the need for people to go into the elements. For some people it’s the ocean. They feel better. For some people it’s the forest, when they go inside they feel like they’re a part of something bigger, although they cannot articulate it. Reichel: But you have to be careful not to become myopic about it in the sense that I’m only doing this to reenergize my battery. Okay, great, the ocean went reenergize you and you feel all reborn, okay so what you going do in return? It’s a type of protocol I think, so What you going do? Check the extended interview above for one Hawaiian perspective on sunbathing. Meanwhile, Friday, a look at Reichel’s prototype for how Hawai’i’s hula hālau can deepen their roots and expand their cultural influence.